Here is how radon can affect your business! Comments Off on Here is how radon can affect your business! Although there is still a high percentage of the Canadian population that is not aware of Radon or its associated health risks, awareness has been increasing in recent years. It is crucial to know how radon gas affects human health. According to Statistics Canada, 7% of homes have high levels of radon. This is of particular concern as radon is the second-leading cause of lung cancer, after smoking, and accounts for 16% of lung cancer deaths, or 3,200 deaths, in Canada every year. The radioactive radon particles in the air can get lodged in our lung tissues when they are inhaled. The energy released by the radioactive particles then damages the lung cells. If you are thinking that this cannot happen in your building, think again. Although the home is a common source of significant exposure, radon can represent a hazard in any building particularly in areas with high natural radon levels or in basements or areas with limited air circulation. Radon is a colourless, odourless radioactive gas that is formed by the breakdown of naturally-occurring uranium in soil, rock and water. It can find its way into nearly any building and can build-up in enclosed spaces. Radon enters buildings through the foundation or drinking water system and tends to be found at the highest concentrations at lower levels of a building, particularly below ground level. And it is undetectable by human senses. The only way to determine if this risk exists in your space is to test your home or office. 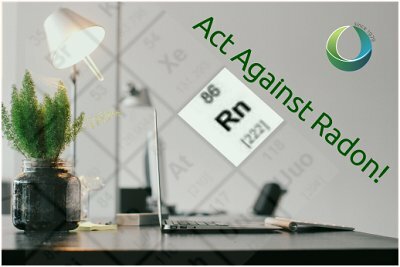 As a naturally occurring gas, radon is different from most other air quality problems: while its existence is not the fault of anyone, its accumulation inside a building at dangerous levels can be easily avoided. Adherence to best practices in building design, construction and renovation provide the necessary solutions and testing is the first step to reduce the risk. Health Canada has established a guideline for residential buildings of 200 Bq/m3 (becquerels per cubic metre). In general, it recommends remedial measures should be undertaken in a dwelling whenever the average annual radon concentration exceeds 200 Bq/m3 in the normal occupancy area. When remedial action is taken, the radon level should be reduced to a value as low as practicable. It also stipulates that the construction of new dwellings should employ techniques that will minimize radon entry and will facilitate post-construction radon removal, should this subsequently prove necessary. There are other ways to reduce the level of radon in a building including fixing cracks in floors and sub-grade walls, providing better ventilation, closing entry routes, replacing the furnace and depressurizing the space below the basement floor slab. There are currently no legal requirements addressing radon specifically but several provinces, including Ontario, have considered legislation to address the issue. Currently, there are three possible theories of liability that may apply in case of radon exposure situations in public buildings: (i) negligence, (ii) products liability, and (iii) fraud and misrepresentation. Potential defendants include the owner or occupier, those involved in new construction and renovations (architects, contractors, engineers), and those involved in the sale of property (real estate agents, brokers, home inspectors). There are also several kinds of warranties (express and/or implied) that are inherent in real estate transactions. The implied warranty of habitability – that is, the assumed assurance of the buyer (or lessee) that the seller or lessor of a property is promising that the property is suitable for its intended purposes – is relevant in the case of radon in indoor air. All building owners are liable for the safety of those making use of their property and buildings. Failure to notify building users of high indoor radon levels, or remediate any known, radon-related risk, building owner(s)/manager(s) could be found liable for the consequences. Depending on the type of building and the building owner, additional legal duties may be imposed. For example, school boards, landlords, and employers have specific duties with respect to ensuring a healthy and safe environment. In most Provinces, there is a requirement that employers provide a safe environment for all workers. In Ontario, for example, the general duty clause of Ontario’s Occupational Health and Safety Act (OHSA), clause 25(2)(h), states that an employer must take every precaution reasonable in the circumstances for the protection of a worker. This would include protecting workers form elevated levels of radon. For commercial establishments, the Canadian Guidelines for the Management of Naturally Occurring Radioactive Materials (NORM Guideline) are considered the industry standard for NORM protection in workplaces. Please note that the above is not legal advice. For a case-specific legal opinion please seek independent legal advice. Is there a problem in my building? In order to determine if radon is present at dangerous levels, one of the multiple testing methods available should be used. Some people are hesitant to conduct radon testing because they are under the impression that it will be invasive – they will have to rip apart their basements – and that it will be expensive. In fact, the costs are very reasonable and the testing will only have to be conducted once if the findings indicate there are no elevated levels of radon present. There are various test kits available commercially and online for the do-it-your-self crowd, but it is important that the tests be conducted properly in order to ensure accurate results. Based on the potential cancer risk associated with radon, it is advisable to hire an expert to ensure the tests are done properly to ensure accurate results. Make sure to hire a certified mitigator for testing. Two common testing devices used for long-term testing are the Alpha Track Detector (1-12 months) and the Long-Term Electret Ion Chamber (1-12 months). Although short-term tests may indicate if a significant problem exists, they are not recommended due to the high potential for inaccurate results. A long-term test is much more accurate as levels of radon in a building will vary over time. A minimum of three months is recommended and a full year (12 month) test period is best. If you want to conduct a shorter duration test, it should be done during the heating season when levels may be highest. Also, the testing should preferably be conducted in the lower levels of the building as the chances of radon built-up are much higher in the basements than in the upper floors. As awareness of this invisible threat to the public safety increases, steps are being taken to reduce the hazard. The first step in this process is to educate yourself and to determine if there is a radon hazard in your home or office, or engage a professional consultant to assist you. The testing process is not invasive, is relatively inexpensive, and will ensure that you understand the radon risk in your environment. Every step you take to protect your health and reduce your risk factors is a positive one. Be aware, and be safe.